An interwar tourist attraction which never failed to awe visitors were Cairo's colorful dahabiehs. 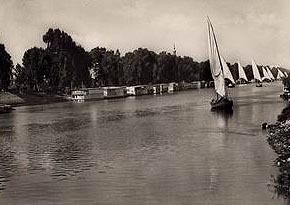 Also known under the name of 'awamat', these floating yet stationary two-level rectangular wooden structures or houseboats, were moored all along the Nile banks of Giza - from Abbas Bridge down to Embaba. Others were secured along the west side of the islands of Roda and Zamalek. The few dahabiehs anchored near the Semiramis or on Zamalek's eastern banks belonged to privileged VIPs or members of the ruling family. As though emulating Cleopatra who, legend says, liked to meet her sundry lovers on sumptuous floating barges, Queen Nazli the Queen Mother kept a well appointed houseboat next to her ephemeral palace on the south side of Zamalek Island. There, away from the scorning eyes of her son's court, she entertained at leisure, something she did with the gusto that befits a racy woman who lives like there is no tomorrow. In a sense Nazli was right. When her son's throne was toppled in July 1952, her coquettish palace became the official headquarters of the Free Officers and her houseboat "Misr," along with so many others, eventually disappeared into the dustbin of history. The name dahabieh comes from the Arabic word dahab or gold. 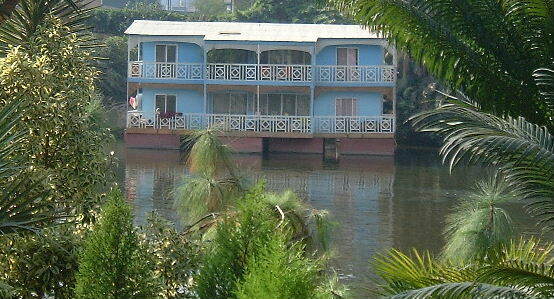 At the turn of the century owners of Nile houseboats were required to paint their outer walls in gold. According to 19th century historian al-Djabarti, houseboats already existed in the time of the Mamlouks. A rich landowner, Ali Bey al-Kebir had one built for him at the cost of 30,000 pounds! During their Egypt campaign, Napoleon's senior officers liked the idea of living on the Nile which they rightly observed provided a natural freshening during long hot summers. It was there that they took to holding grand receptions. Seventy years later, during the reign of Khedive Ismail, houseboats were back en vogue. Owning a dahabieh was a must for any man of consequence. Dahabiehs were not always stationary. At times, floating palaces were seen sailing up and down the Nile either on their own steam power or towed by tug boats such as the ones used by 19th century European Nile travelers. Yet, we learn that because of high costs, moving these itinerant dahabiehs were few and far between. In her book New Egypt, travelwriter A. de Guerville states that dahabiehs in the 1910s were not within the reach of every purse. "According to the number of persons traveling together they cost from 400 to 600 pounds a month, everything included." As it turns out, this Frenchwoman preferred to travel with that most famous of Nile operators, Thomas Cooks of London whose dahabiehs were second to none. As dahabiehs ceased to be regarded a summertime indulgence for the privileged class, the practice of painting their front walls in gold was dropped. And once fresh water, city gas, electricity and telephones were available, more and more people chose dahabiehs as permanent homes. In no time the banks of the Nile turned into a floating neighborhood. The 'boat people' were eventually accorded their own amenities such as a special police unit, their own sheik al-hara, a floating medical clinic as well as clubs, cafés and, why not, their own music hall! It was not long before door to door peddlers and traffickers arrived in rowing boats and small feloukas. During World War II houseboats were in high demand. Not only was there a shortage in construction material but there were over a million Allied troops passing through Cairo. Senior British officers were in desperate need of accommodations. Capitalizing on an unprecedented demand, Cairenes took to leasing their terra firma homes moving into their summertime dahabiehs. Alternately, they leased their dahabiehs to the high ranking brass. Understandably, it was not long before some dahabiehs under the camouflage of high priced bordellos or makeshift night clubs became the rendezvous of double and triple agents. It was in one of them, moored next-door to the notorious bellydancer-agent Hikmat Fahmi, that German spy John Eppler (Hussein Gaafar) was apprehended. Foreign diplomats also took to entertaining on dahabiehs where they felt what was not considered 'acceptable' in a regular house they could get away with on a houseboat. Cecil Beaton describes how the one owned by Alexander Kirk, the wartime American minister to Cairo was the essence of kitsch. "The houseboat on which we dined was done up in beige and white, with lighting from under the gold brass tables... the bowls of white ostrich feathers I though was going a bit too much." Today, the Nile that passes through Egypt has been irrevocably tamed by the High Dam. Dahabiehs which towards the end of their day had become seedy shanties, are gone. Come to replace them are concrete-built officers and private clubs and entertainment centers. If Beaton once complained about kitsch-sur-Nil one wonders what he would have to say about TGIF's and speakseasies cropping up each day polluting the Nile with tecnomusic, styrofoams and plastica.